Celebrity hairstylist Sarah Potempa shares party-ready looks for every length—and they all take 15 minutes or less! If your hair is cropped, try a textured style and a headband. Create your desired part on wet hair (to get the cleanest line). Apply a styling product at roots: A volumizing spray, like Kenra Professional Platinum Voluminous Touch Spray Lotion (ulta.com), is good for fine hair, while a moisturizing mousse, like Bb. Thickening Soft Full Form Mousse (bumbleandbumble.com), works well on coarse hair. Blow-dry forward and down, tousling with your fingers. Once dry, spritz hair all over with a texture spray, like Herbal Essences Tousle Me Softly Spray Gel (target.com), and add a drop of pomade on ends of front pieces to add definition. Place the headband just behind ears and adjust hair around it. If your hair ends below your collarbone, try a French braid updo. Start with dry hair and brush it straight back (no part), adding a little shine spray, like Garnier Fructis Style Frizz Guard Anti-Frizz Dry Spray (garnierusa.com, $4), all over. 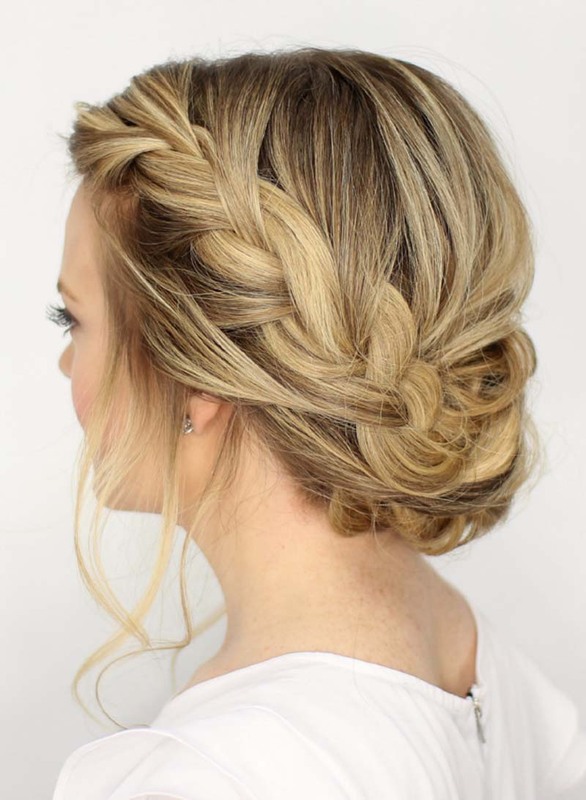 Gather a large section of hair at top of head, separate it into three smaller sections and create a French braid. Continue the braid until there is no more hair to add, then finish with a classic three-strand braid and secure with a clear elastic. Roll the end of the braid under itself at base and secure with hairpins. Need a quick French braid tutorial? The right section goes over the middle section, then the left goes over the middle. Add a little hair from right side to right section and continue with this pattern, alternating right and left. Dress: Adrianna Papell. Earrings: Gabriel & Co. If your hair falls between chin and shoulder length, try a half-up topknot. 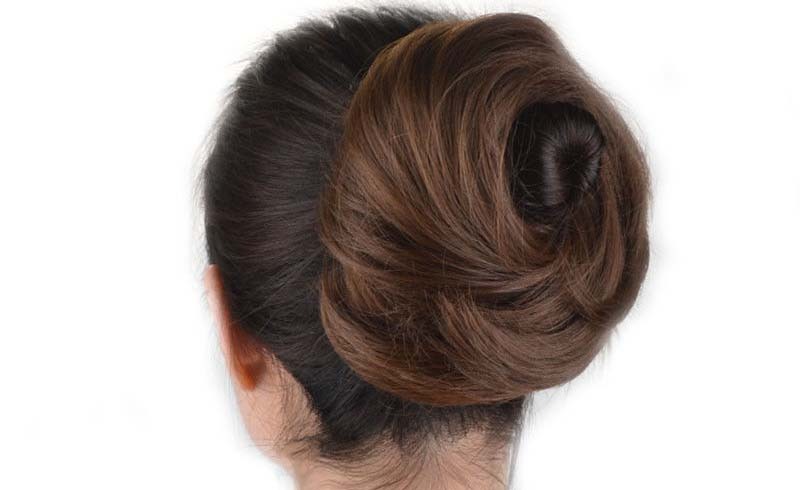 Apply a heat-protectant spray, such as Sauce Beauty Hot Sauce Thermal Protectant Spray (sallybeauty.com), on damp hair and rough-dry using a blow-dryer and your fingers. To get soft waves, part hair and clip up most of it on one side, leaving the bottom layer out to be curled first. Using The Beachwaver Co. Beachwaver S1 curling iron (beachwaver.com, $129), curl bottom layer by holding the iron upright with the clamp facing inward and curl hair away from your face. Continue with 1-inch sections, finishing with the top layer of hair. When you’ve finished one side, spray a paddle brush with hairspray and brush through large sections to turn curls into soft waves. Repeat on other side of head. Pull the top section of hair into a ponytail and secure with elastic. 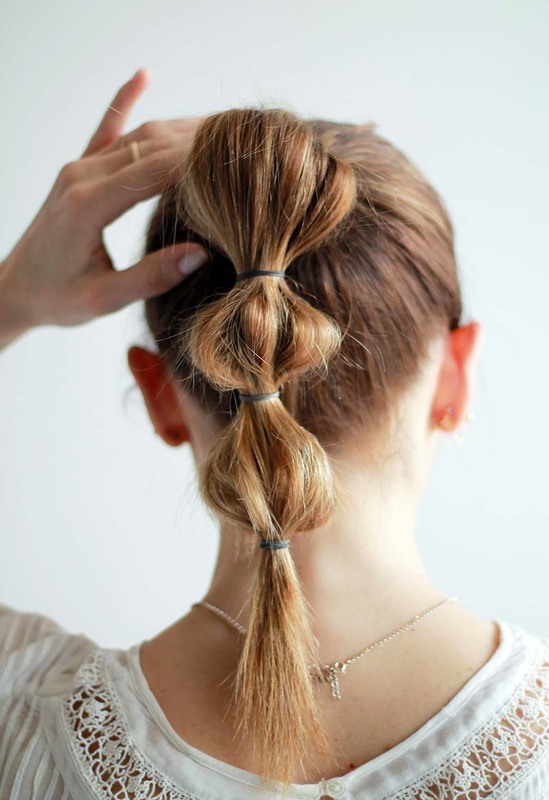 Twist the pony into a bun and secure with bobby pins. To get rid of flyaways, apply a flexible hairspray, like The Beachwaver Co. Great Barrier Heat Protectant Hairspray (beachwaver.com), along hairline. Then roll the canister over hair to lock in the hold. If you have long hair, try a bubble ponytail. Angle head upward (looking toward ceiling) and pull hair into a tight pony, following the line from jawline to top of head, and secure with an elastic. Conceal the hair tie by taking a small section of hair from below the elastic, wrapping it around elastic and adding a few small bobby pins. Create the first bubble 2 to 3 inches below by securing hair with an elastic, then gently pulling on edges of bubble to create a rounded shape. Repeat the hidden elastic trick and continue creating bubbles. If you have thick, coarse hair, flat iron it in large sections first to keep things sleek. Our expert: Sarah Potempa, celebrity hairstylist and founder of the Beachwaver Co.